Head Coach Kevin Parrish has moved quickly to add a physical presence to his roster by making 21 year old forward Mason Webster the first new face to join the Invicta Dynamos this off-season. 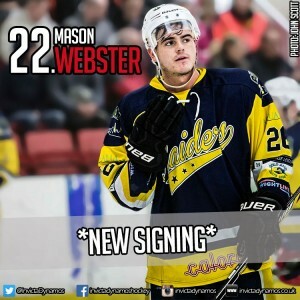 Mason Webster is a product of the Chelmsford junior setup and he rose through the ranks in Essex ahead of his first senior outing in the NIHL South Division 2 in 2011/12. By 2013/14 the forward switched to the Haringey Racers before the EPL came calling the following campaign as Webster made 21 appearances for the Playoff winning Peterborough Phantoms. 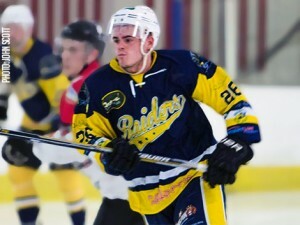 Last season his services were then secured by the London Raiders and the skater enjoyed an excellent debut campaign in the NIHL South’s top tier with 8 goals and 28 assists for 36 points in 32 outings. His work ethic, points return and willingness to drop the gloves for his teammates made him a firm favourite in the gold and blue and Webster received the Newcomer of the Year award at the side’s end of season presentation evening. Now he will be hoping to build on a formidable start in the NIHL South Division 1 as he switches to Kent and joins up with the Invicta Dynamos for the 2016/17 campaign. Speaking after making Mason Webster his first new signing of the off-season Head Coach Kevin Parrish said, “I’m delighted that Mason has agreed to join us at the Mos and he will give the side an extra dimension that we were perhaps missing at times last term. Mason is a physical player, who likes to hit, brings energy to the ice and will drop the gloves to defend his teammates and there were times in 2015/16 that we needed that extra physicality. However he is far from a one trick pony and he showed last season with the Raiders that he can put the puck in the net and link up well with his teammates. Mason has many facets to his game and I’ve no doubt his addition will help make us a more rounded outfit. I look forward to working with him from September”. Mason Webster, who will wear number 22 next season, is the fourth player to commit to the Dynamos ahead of 2016/17 and the first forward on a roster that so far includes netminder Damien King and defencemen Ondrej Zosiak and Arran Strawson. Stay tuned to the club’s website, Facebook page, Twitter feed and Instagram to be the first to find out his future teammates with news of a returnee to follow on Friday. Warm-up Jersey – For just £125 get your name or logo printed on the back of Mason Webster’s warm-up jersey. Sponsors are then presented with the jersey to keep at the end of the season. Game jerseys – Get your name or logo on the back of Mason Webster’s game jerseys and become a part of the action.